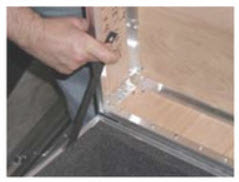 Nylon Lid Stay - Installs to the lid and body of a case interior to prevent the lid from flopping over backwards when open. Depending on the lid size and thickness of the case walls, one stay my suffice, but two are recommended for larger lids, especially with 3/8" & 1/2" case walls. When in doubt, use two, one on each side of the case. Even though the stay has steel eyelets on either end for rivet installation, backing washers that are slightly larger in diameter than the eyelet are recommended. THIS ITEM REQUIRES TWO DRILLED INSTALLATION HOLES IN THE CASE WALL TO INSTALL.